These Knitting Patterns for Christmas is a great way to utilize free knitting patterns and save on the holiday season. It can be expensive and time consuming to prepare for the holiday, but knitting can relieve the stress and cost. Everyone loves having Christmas crafts to make, it helps get the excitment about the holiday up, which is why knitting some of your holiday decorations and gifts this year is the perfect idea. Your friends and family will love recieving special knit creations. Get your needles and yarn ready, you've got much to prepare! Add these patterns to your 12 days of Christmas crafts and start on your knit Christmas stockings, homemade holiday gifts, and Christmas table decorations. What's required for these Knitting Patterns for Christmas? Yarn!! These fun knit Christmas patterns are great for decorating your home. From afghans to dishcloths, stockings to coasters, these seasonal knits will help you get your home in the holiday spirit in no time. Chilly Snowman Christmas Stocking: Having handmade Christmas stockings above the mantel is an adorable extra decoration that plays an important role on December 25. Santa Claus Dishcloth: Christmas crafts to make come in all shapes and sizes, this one is useful for all your holiday cooking adventures. Winnie the Pooh Stocking: Deck out your fireplace with unique Christmas stockings. This is perfect for any lover of the 100 acre woods. Knit Snowman: Everyone loves snowman Christmas crafts. Here's a simple way to include Frosty in your house's decor. Peppermint Coaster: Christmas crafts with a purpose are cheap Christmas decorations and unique Christmas gift exchange ideas. Christmas Bow Pillow: Cuddle up next to the fire with this pillow or throw it on the couch when the family is gathered around. Knit Christmas Stocking: Update your Christmas decorations with handmade Christmas stockings. Knit these up for the whole family. Classic Christmas Stocking: Old fashioned Christmas stockings to keep with tradition. NEW! Christmas Star Afghan: This beautiful afghan is great for your living room or bedroom. Add some Christmas cheer to any room in your home. NEW! 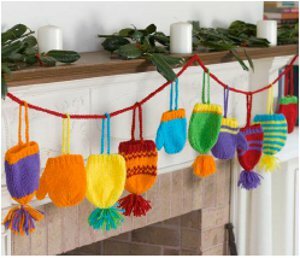 Bright Knit Hats and Mittens Holiday Garland: Decorate your window, tree, or banister with this colorful and fun winter garland. Best of all, you can have it out all winter long! Knit wearables make great gifts and stocking stuffers. With these simple hat and scarf patterns, you'll have your gift list done before you can say "bah-humbug!" Knit Rudolph Hat: Use this free knitting pattern to add a little holiday cheer to your young one during the cold month of December. Collared Zip Cardigan: Searching for great Christmas gift ideas? This present can be worn all winter, but works perfect for the holidays as well! Knit Dog Coat: Because the dog needs to get in the spirit, too! Christmas crafts for your furry friend are fun and a festive way to get the pup ready for Santa. Knit Christmas Pullover: Celebrate a first Christmas with your little one in this. Holiday Knit Scarf: When you're making your list of homemade holiday gifts, add this knit scarf to the list. We love it. NEW! Cozy Rudolph Slippers: Everyone "nose" this fun character! Keep your toes warm on Christmas morning with these adorable knit socks. NEW! 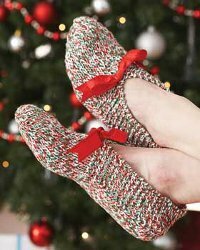 Holiday Knit Slippers: Great for feet of all shapes and sizes, these comfortable knit slippers make a great gift for a friend or loved one.